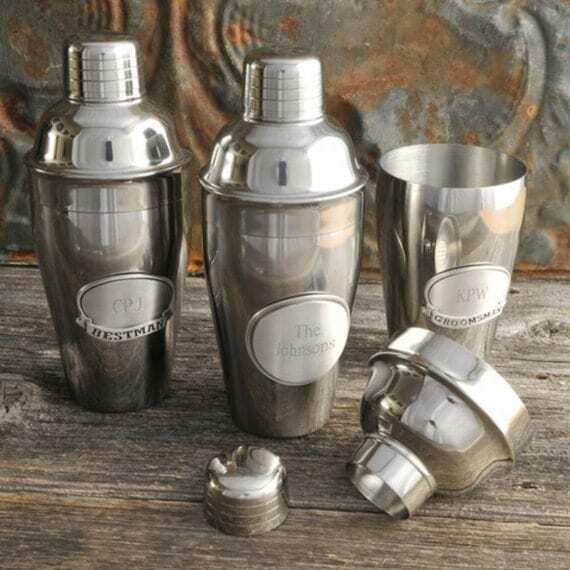 The Manhattan Cocktail Gift Set makes it easy for anyone to recreate this classic cocktail. You get bitters and glasses, a shaker and cherries… totally up to you which brands of alcohol you want to add to the mix. All you need is a bottle of Rye Whiskey, and a bottle of Vermouth. Just how classic is it? The first “Manhattan” was said to have been served at the Manhattan Club in New York City in the 1870’s! But we all know, what’s old is new again… and something that tastes really good never really goes away! Legend has it the drink was invented for a party thrown by Winston Churchill’s mother, Lady Randolph Churchill, for the presidential candidate, Samuel Tilden. Now… stories spread as stories do… and it seems odd that British Royalty would be going around creating drinks for American Presidential hopefuls… but… why not? The set comes with all you need (except the alcohol), to make a perfectly balanced Manhattan. 2 Classic Lowball Glasses, perfect for serving those Manhattans to you, and that someone special. Maraschino Cherries, the essential Garnish! (Don’t go adding olives! You want cherries!) And these are NOT those fluorescent red things that you get from the supermarket! The Luxardo Maraschino Cherries are imported from Italy. Their fantastic flavor will give your Manhattan Cocktail a hit of delightful flavor that just can’t be matched. A bottle of Angustora Bitters, which can also be used for other Cocktails. Don’t underestimate bitters… this essential ingredient adds that certain NEEDED flavor profile to many cocktails. Shake the Rye, Vermouth and bitters in the Cocktail shaker with ice. Strain into an ice filled lowball glass. 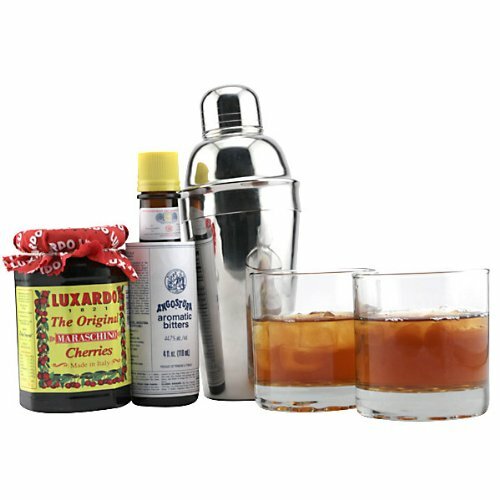 Dry Manhattan is made with dry Vermouth instead of sweet vermouth and served with a twist. Rob Roy is made with Scotch whisky. Perfect Manhattan is made with equal parts sweet and dry vermouth. Cuban Manhattan is a Perfect Manhattan with dark Rum as its principal ingredient. Brandy Manhattan is made with Brandy instead of whiskey. Tijuana Manhattan is made with an Anejo Tequila.